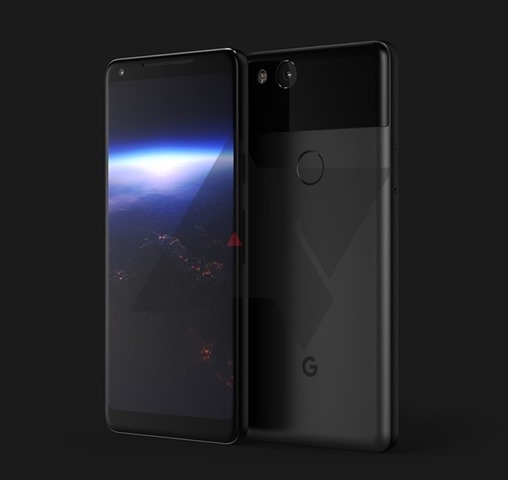 A new alleged render of the upcoming Phones from Google have been leaked, and this is what the Pixel 2 XL looks like. The display does look kinda similar to the LG G6, doesn't it? That's because the device previously reported as Taimen, it is manufactured by LG, according to Android Police. The leak says that the screen on the Pixel 2 XL is a 6 inch AMOLED display, and that it has a 2:1 aspect ratio. We can see the rounded edges on what appears to be an LG FullVision display, which makes the design of the Pixel 2 XL an almost bezel-less phone. It is 2017, and Google is catching up with the LG G6 and the Samsung Galaxy S8.That being said, there is not much of an improvement on the back panel, as the Pixel 2 XL still sports a single rear camera. And the back panel's design is similar to the first gen Pixel phone, except that the fingerprint scanner is placed just below the glass portion, which itself is a bit smaller. The Pixel 2 XL seems to have a large speaker grill on the front, next to the selfie camera. The phone is also reported to have a squeeze frame like the HTC U 11, which will allow Pixel 2 XL users to interact with Google Assistant. According to a recent leak on XDA, the display on the Pixel 2 XL is Quad HD 1440p resolution screen, and the phone will be powered by a Qualcomm Snapdragon 835 processor @2.45GHz with 4GB of RAM. The device is expected to come in 64GB/128 storage variants. The other Pixel, will sport a 4.97 inch 1080p Full HD display, with a similar design to the previous gen "big bezels Pixel", with the same chipset and RAM configuration as the Pixel 2 XL. The Pixel 2 will have 64GB of storage, and will allegedly skip the 3.5mm headphone jack to include stereo speakers. Pixel 2 XL alleged render leaked, will be manufactured by LG and sports an almost bezel-less design.